Dinner on the South Bank | Where have the days gone? For dinner we decided to go to a brewpub in the city, so after showering and changing, we walked to a bus stop since Alex thought that might be quicker to get to where we wanted to go. After walking up and down Albert St a couple times, we found the address the brewpub was supposed to be at, and found a torn sign on the door saying they had closed down in late September. Rats. Alex suggested we try the South Bank then, since we had planned to go there for dessert after dinner anyway. 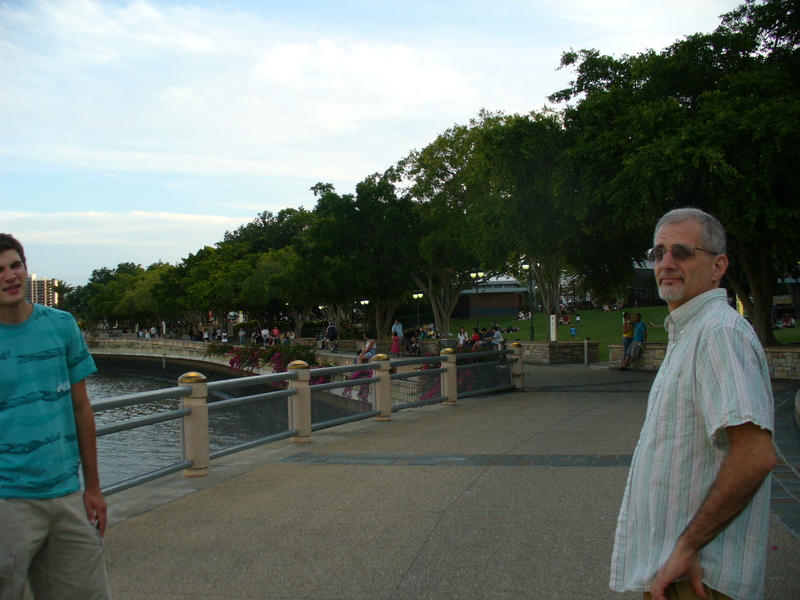 We walked across a bridge, and then along the river and up into the South Bank area. 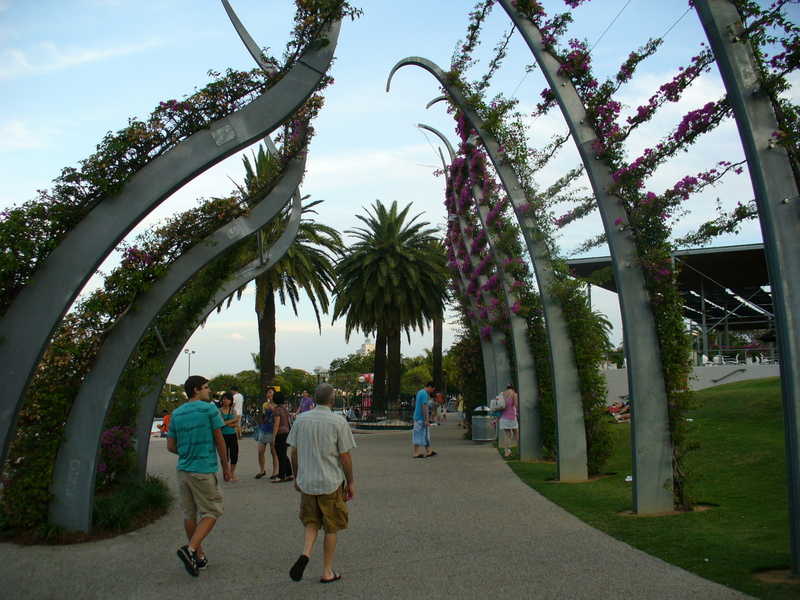 I really like this trellised walkway that meanders all through this area – it's covered in a pinky-purple flowered vine. After dark, the curved posts are lit. We decided to have dinner at Amici's, where Alex had eaten before. It was OK, though the service was even slower than normal (apparently), the Shiraz I chose was pretty bad (too green maybe? ), and I was kind of falling asleep in my seat by then. Dessert, on the other hand, was fantastic! We debated a bit over whether we wanted coffees or gelati or what, so we walked along King St a bit, and decided to stop in to Batavia, which Alex had heard was a really cool tea shop, just to see it. 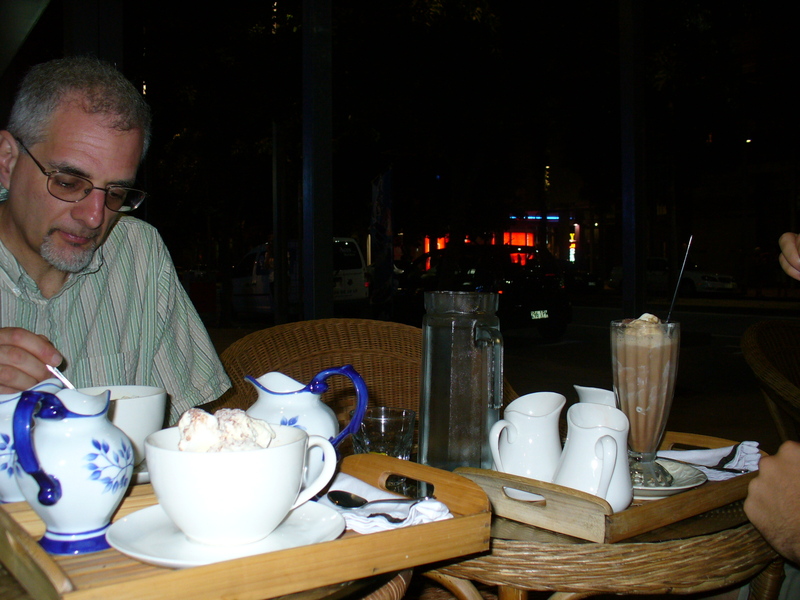 As it turned out, the menu included a number of coffee/ice cream combinations, so we sat in the comfy cushioned wicker chairs out on the sidewalk, and ordered. 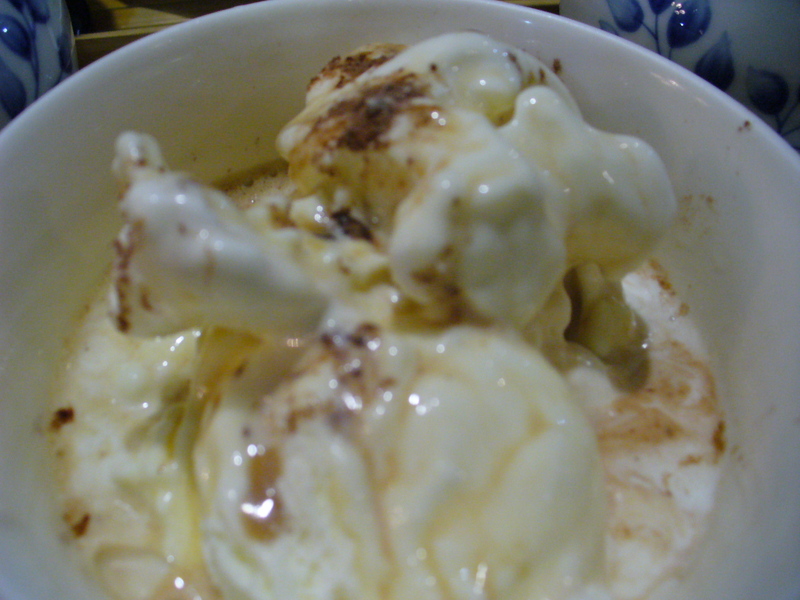 I got a mochagatto, which was a big bowl of ice cream, with a pitcher each of espresso and hot chocolate to pour over it… mmm! Al got an affogatto (similar but only espresso) plus a ricotta tart, and Alex got the iced mocha mainly because it had 5 things to mix to taste (ice cream, milk, cold espresso, cold chocolate, and sugar syrup). Each of our selections was served on a bamboo tray with fine china pitchers, along with a glass of refreshing lemon-mint water. The rest of the menu looked really good, too, but of course we'd just eaten. Excellent excellent choice - highly recommended! 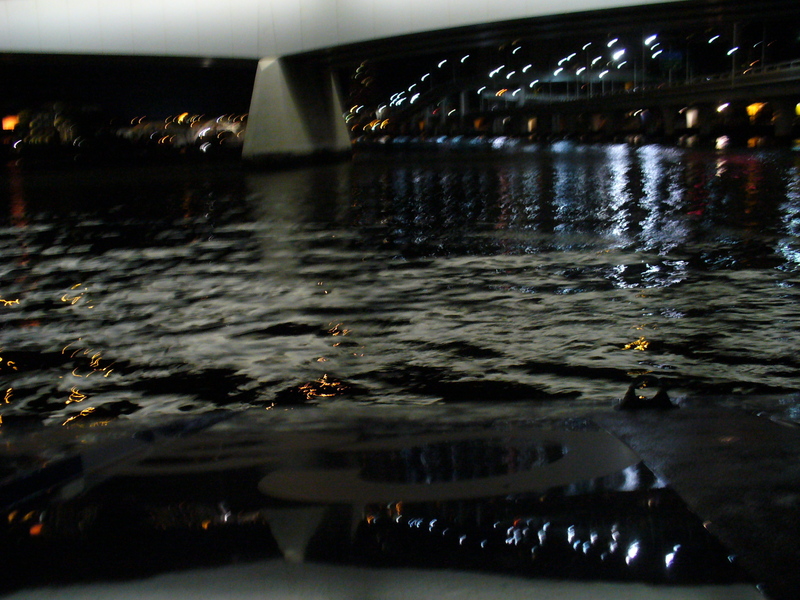 Then we took the City Cat back to the stop near our apartment, and Alex continued on it to the stop near his apartment. What interesting, delicious sounding sweets! 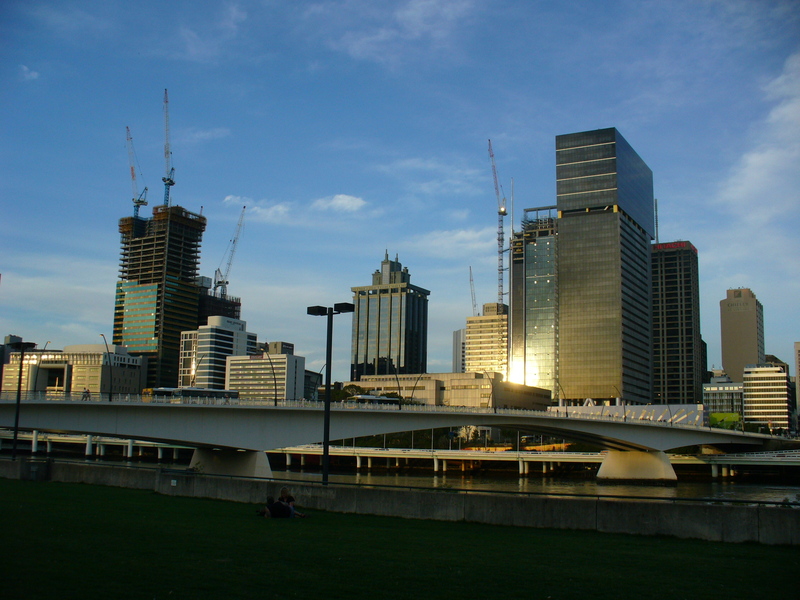 Love the photo of the Brisbane River. 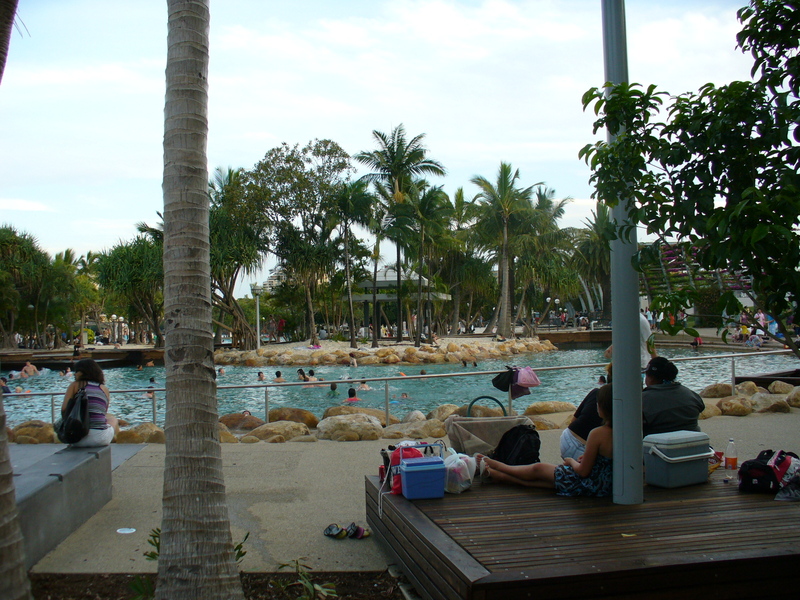 I went to South Bank when it was first developed – many years ago – I suspect a lot has changed since then. I just heard on the news today about the 7-point-something earthquake in Jakarta today. Did the ripples of it affect Australia?